A denizen of deep snows, capable of traveling hundreds of miles in conditions that send other land animals into hibernation, wolverines were extirpated in Washington by over-trapping, and shot on sight as vermin, like most other predators in the 1900s. 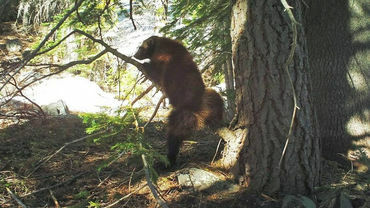 Remnants of Washington’s native wolverine population retreated to Canada. From there, they have begun a slow recolonization of their native habitat in Washington, starting with the North Cascades. This is good good good news during this age of Extinctions. Well that is good news indeed!! !